Dane Cameron qualified the No. 6 Acura ARX-06 DPi in the second position on Saturday afternoon, just behind his teammate Helio Castroneves. When the race began, Cameron fell in behind Castroneves and held the second position until both drivers hit pit road for the first round of pit stops at the 45-minute mark of the two hour and 40 minute race. Race strategist Kyle Moyer short-fueled the No. 6 Prototype to gain track position that gave Cameron the lead, which he would hold until pitting at the one hour and 29 minute mark of the race. In addition to four tires and fuel, Cameron gave way to Juan Pablo Montoya for the rest of the event. Unfortunately the lead was surrendered to Ricky Taylor, who had taken over the driving duties from Castroneves earlier in the event, during the exchange. At one point Montoya had a 10-second deficit to his teammate, but he cut that time difference down to under two seconds on a couple of occasions. The No. 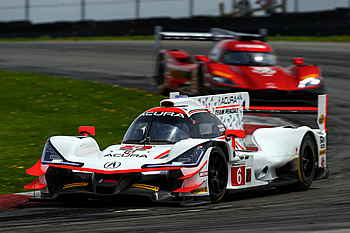 6 Acura Prototype crossed the finish line in the second position to give the team their highest IMSA WeatherTech Sports Car Championship finish in four races this season, and their second top-five result. 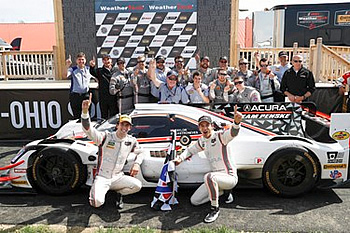 "What a great weekend for Acura Team Penske finishing 1-2 in the Acura Sports Car Challenge. Congratulations to Helio and Ricky. They were super-fast all weekend, as were Juan and I. We got out front, led some laps and I thought we had a shot at the win but the 7 car had good strategy that paid off. Juan drove the wheels off the No. 6 Acura and closed the gap several times but Ricky was strong at the end. It's just great to see the hard work of everyone paying off with speed and, now, wins." Helio Castroneves captured his first IMSA WeatherTech SportsCar Championship pole position on Saturday when he nipped his Team Penske teammate, Dane Cameron, on the last run of the qualifying session. The three-time Indianapolis 500 winner paced the field for the first 45 minutes before pitting with Cameron. The pit stop included a driver change to Ricky Taylor and, as a result, Taylor lost a few spots before returning to the track in the fourth position. Race strategist Tim Cindric called Taylor in early for a full fuel load just prior to the two hour mark of the race, which set his driver up to inherit the lead after Cameron pitted for four tires, fuel and a driver change to Juan Pablo Montoya. From there it was a matter of Taylor driving a clean race for the balance of the time left, which he did with ease to score the first win in Acura Team Penske history and the first overall win in sports car racing for Team Penske since winning at Miller Motorsports Park in May of 2018. In the process, Taylor became the 50th different driver to win a race for Roger Penske in the 52 year history of Team Penske. Sunday's victory is the 87th sports car win for Team Penske. "I'm driving with one of the best organizations in the world, one of the best manufacturers in the world. We visited Acura's factory for the NSX on Thursday and really got to see all that goes into these beautiful cars, and it really gives you a good sense of pride. On top of that, to win for the first time for Mr. Penske is outstanding and to start the month of May off for Helio with a win is awesome. There was so much pressure to get the car from him in the lead. He did an awesome job, so I had to fight to make his efforts worth it." Cameron & Curran make it two in a row! It's Action Express again; Second straight 1-2 finish!